LAMM ML3 Signature power amplifiers. Rest of system: Wilson Audio Maxx2 speakers, Zanden 2000P CD transport and 5000S DAC, TW-Acustic Raven AC 3 motor turntable with 2 arms, Dynavector 507 cartridges, Silent Running Audio racks and stands, Kubala-Sosna Emotion interconnect and speaker cables. 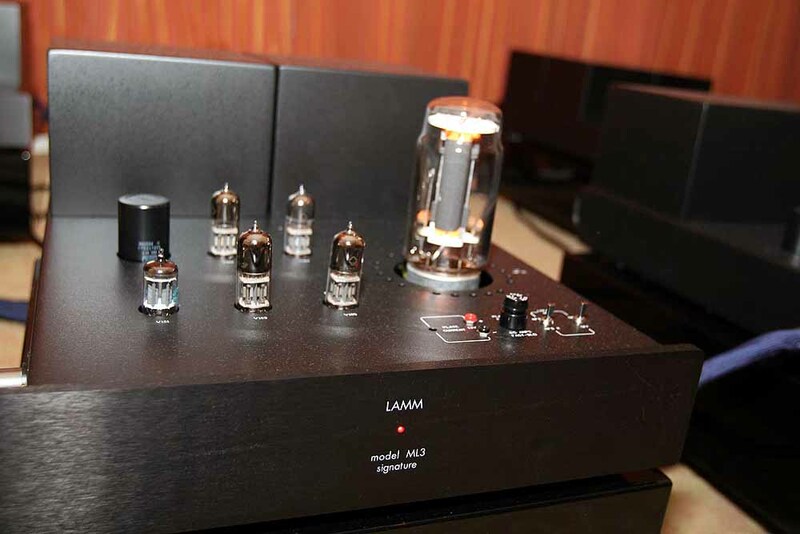 Lamm M1.2 Reference and ML1.1 amplifiers. Rest of system: Gershman Acoustics Black Swan speakers, NeoDio NR Two transport and NR Two DAC, Critical Mass Systems racks and stands, Kubala-Sosna interconnect and speaker cables, ClearAudio Anniversary turntable, Graham 2.2 tonearm. Well, another CES is done, and as I sit here and think about what I will take away from this year’s show, I realize that, even amongst buildings filled with interesting new audio gear, it’s the equipment I’ve already encountered and used whose sound impressed me most. As I listened to the Lamm ML3 Signature amps driving Wilson Audio MAXX 2 speakers, I could hear why I use MAXX 2s and Lamm amplifiers at home. The digital source for this system was also from a maker whose work I greatly admire — Kazutoshi Yamada, whose Zanden products appeal to me on a fundamental level, where my understanding of how live music sounds resides. …The Zanden 5000S DAC and 2000P transport only proved once again that they are the very best digital gear I’ve heard. I wish I had some revelations for you — some unknown amp or CD player that I could tout, and perhaps even discover. Instead, I can only restate how much I think of Vladimir Lamm’s, Kazutoshi Yamada’s and David Wilson’s work — and say how fortunate we are that it’s possible to use all of their products together to a very fulfilling musical end. The TW-Acustic Raven AC ($11,500) with a pair of Grahm Phantom tonearms and Dynavector XV-1s cartridges. This ‘table was in use in the Lamm room, which I wrote about yesterday. One of the unfulfilled promises of last year’s CES was Vladimir Lamm’s ML3 Signature mono amplifier. Oh, it was at CES 2007 all right, but only a single amp, which Vladimir decided to play on the final day of the show. I listened with rapt attention, waiting for the time when I’d get to hear a pair of these pricey, two-chassis amps. Well, they’re here. The ML3s, which have risen in price to $139,290 per pair, were driving Wilson Audio MAXX 2 speakers, with both analog (courtesy of a TW-Acustic Raven AC turntable) and digital (via the extraordinary Zanden 5000S and 2000P DAC and transport) sources. And I better not forget to mention the Silent Running Audio products in use, including the new Virginia Class platforms for the ML3s. These amps sounded gorgeous and far more powerful than their 30-watt rating would suggest. I played a cut I heard last year in mono, a piece with a bowed bass, and was entranced with the texture and weight in the instrument’s lowest reaches. In the past I’ve praised Lamm amplifiers for expertly combining truth and beauty, and the ML3 pushes this notion to a new plateau. Owners of Wilson Audio X-2 speakers, especially the new Series 2, will want to investigate these amps immediately. The speakers’ high sensitivity and the amps’ ravishing sound seem destined to be together. In contrast, the Gershman Black Swans ($25k) with Lamm amplification, while a bit darkish in balance, was one of the Best Sounds of the Show, with superb bass (superb everything, actually, from top to bottom). It isn’t news anymore, but this is one terrific loudspeaker. We now leave the 30th floor and leap to the 34th, where the Wilson Audio MAXX 2s ($45k) made their best showing since I heard them driven by ARC electronics several years ago, thanks to Vladimir Lamm’s fabulous new four-chassis ML-3 monoblock amplifiers (priced at a cool $139k) and TW Acustic’s supremely musical AC-3 turntable (reviewed by me in Issue 180). This marvelous system reproduced the Prokofiev First Violin Sonata with superb definition, timbre, bass, and soundstage depth, combining incredible “sustain” on pedaled piano notes with incredible control and detail in the fiddle. That said, there was a slight, persistent spot of added brightness in the upper mids and lower treble followed by a slight roll-off in the top treble–a profile I associate with Wilson’s tweeter. Still and all, this was a great stereo system (and a great debut for Vladimir’s amp). Clearly, another top contender for Best of Show. Best Sounds: No single speaker stood way above the pack this year in my price range, so I’m going to name several Best Sounds of Show: the Magico Mini II, the Magico V3, the Quad Reference ESL-2905, the Cessaro Alpha 1, the Nola Baby Grand Reference, the Von Schweikert R-5, the McIntosh XRT1k, the Gershman Black Swans, the Wilson MAXX 2s, the Avalon Indras, the TAD Reference One and TAD Compact Reference One, and the Kharma 3.2.2s. The Lamm ML3 monoblock power amplifier. 32 Watts of single-ended power is not a very impressive characteristic on a background of a multitude of tube amplifiers that exist on this planet — but that’s not the case if we are talking about the amplifiers produced by the New York-based company Lamm Industries. A head of the company, Vladimir Lamm — well-known to the radio amateurs of the former USSR as Vladimir Shushurin — developed a concept and topology of the GM-70 tube-based amplifier over 20 years ago. The realization of this concept took tremendous effort, huge financial investments and engagement of the best transformer manufacturers in the world. The working prototype was shown last year (at CES2007); this CES, the production unit debuted in a system with Wilson Audio Maxx2 speakers, which, by the way, are the not the easiest to drive. However, the ML3’s 32 Watts demonstrated quite clearly a complete superiority of the Watt quality over the Watt quantity. Moreover, just based on the Show results, the ML3 is obviously so much more superior to all the possible contenders that it alone occupies the throne of the “Amplifier’s Olympus”. Besides the heavy weight of these amplifiers (about 140 kg), a potential customer should pay attention to the price ($167,000 in Russia) — unless, of course, he belongs to a category of people who do not really pay attention to the price of things. The Lamm/Wilson/Zanden/TW-Acustic room remarkably (at least to me) was a wonderful, relaxed place to hear some great music. Jeff Catalano of High Water Sound was running this room and I was greeted with a host of original mono recordings playing on the 2-armed TW-Acustic Raven AC 3-motor turntable. I’ve heard Wilson speakers a few times and while it seems ridiculous to offer an opinion on ’em — kinda like spitting into the ocean to make waves — I thoroughly enjoyed my time with the Wilson Maxx2s this time. I actually went back first thing the next day to just sit and listen some more. I’d suggest, with complete respect to the various manufacturers, that Jeff Catalano had a lot do with this enjoyment. Jeff is now four for four in terms of rooms at audio shows that I completely enjoyed. And a big reason I believe this to be the case is his respect for and love of music (I’d recommend checking out Jeff’s blog for his ‘Playlists’). I’d even go as far as to suggest that this exact same room put into the hands of a high-resolution spinning amusical meister would have left me cold. But that’s just me. And while we’re in a room with a $139,290 pair of 32-watt, GM-70 based single-ended directly heated triode Lamm ML3 Signature monoblock amplifiers (and I don’t mean to be a wise guy but I would have rounded out that price one way or another), now may be as good a time as any to consider price. Since I will never own a system that costs upwards of a few hundred thousand dollars, I have no rational basis for determining value in this price league. That’s because value is in part determined by affordability. And affordable is not a fixed number. Whether we like it or not, there are people who buy gear that costs this much and more. I have no issue with this fact whatsoever and I have no issue with the fact that that person will never be me. In terms of value, if someone was considering buying the Wavac SH-833s and then heard the new Lamm ML3 Signature monoblocks and thought “whoa, these things are even better”, they just saved themselves about $200,000. That’s value if I’ve ever seen it. Or to think of it another way, let’s say your system cost $9,750 and that amount represents 15% of your annual income of $65,000. Now let’s imagine some guy who just bought the complete Lamm/Wilson system in the Venetian Suite 34-309. The whole damn thing from soup to Kubala-Sonsa. And this price represents 3% of his annual income. You, my friend, have just been less thrifty than Joe Lotsabucks. Relative value and net worth are harsh and sobering bedfellows. Of course none of this has anything to do with musical enjoyment which has nothing to do with how much money you have or spend on your gear. Those of you who know me will undoubtedly find this an odd choice, as I have never heard Wilson’s at a show that “grabbed” my attention. This year was different. Fronted by the TW-Acustic Raven AC 3-motor turntable, sporting a pair of Graham Phantom B-44 arms, one fitted with a Dynavector XV 1S cart, the Lamm LP2 phono preamp handled the small gain preamplification. Zaden’s 2000P transport and 5000S DAC combo recreated ones and zeros while the Lamm L2 reference preamplifier sent its glorious signal on to the ML-3 Signature single-ended triode monoblocks with outboard power supplies. This was the world premiere of the ML-3 Signature, and it was auspicious to say the least. The Wilson MAXX2s simply came to life as living, breathing transducers, presenting a fluid, detailed, and focused soundstage with a relaxed and undisputable natural presentation. This is the first time that I’ve heard the MAXX2 virtually come to life, sounding more like music than a scientific instrument to reconstruct music. Granted, all previous auditions I can recall had them paired with Halcro power. Somehow, that combination, while very resolute and detailed, just sounds soulless and uninvolving by comparison. This combination was sheer magic, providing solid evidence as to why these two companies are so highly thought of and respected in the audio community. Gershman Acoustics Black Swan loudspeakers with Lamm Industries 1.1 amplifiers, and Kubala-Sosna cables. amplifier behind it, with Kubala-Sosna Emotion cables. Lamm Industries ML3 Signature amplifiers on Silent Running Audio stands. Another shot of the Lamm amplifiers. Kubala-Sosna Emotion cables in the Lamm/TW Acustic room. The guts of the Lamm amplifier and its power supply. Another shot of the innards of Lamm amplifiers. The Lamm room with Wilson Alexandria X2 loudspeakers. It was no mystery that the Lamm Industries room would sound amazing, it didn’t disappoint. The room included the new ML3 Signature single-ended triode monoblocks in pure class A operation. Smooth, extended and richly detailed coming from a mere 32 watts, Lamm partnered the amplifiers with Wilson Audio Maxx2 speakers. Now brace yourself, the pair of ML3’s are $139,290.00! This was my favorite room for listening to classical music. There’s definitely a magical synergy with the Lamm electronics driving Gershman Acoustics speakers. Present were the power, the weight and the airy sounds of symphony hall being recreated in this room. This was room captivated my imagination as I sat for a good while, enjoying the music. Music was presented via the Gershman Acoustics Black Swan speakers ($36,000) being driven by the Lamm M1.2 Reference ($21,690), ML1.1 ($22,890) amplifiers, with Lamm L2 Reference preamplifier ($14,790) and Lamm LP2 phono preamplifier ($6,990). Digital source was provided by a NeoDio (from France) NR Two Transport (5,800 euros) and NR Two DAC (5,800 euros). Vinyl was played on a Clearaudio Anniversary turntable with a Graham 2.2 tonearm. Kubala-Sosna cables were used throughout. Equipment stand and isolation bases were provided by Critical Mass. What does this mean for people with, uh, restraint?